Make an appointment at our classic barber shop today! The only place to get a classic men's haircut is at an authentic barber shop. And only a trained barber can deliver. In the Lockport, NY area, that barber is Mark McKee. Mark McKee's Barber Shop has become the destination for men and boy's haircuts for a reason. People got tired of waiting in line at the chain salons just to have their stylist botch what should be a very simple trim. They wanted a classic American barber shop that they could really rely on. And so they made an appointment with Mark McKee. Mark McKee opened his shop in August of 2007. He received his Master Barber license in June 2007 after successful completion of Shear Ego International School of Hair Design in Rochester, New York. Since becoming fully licensed, Mark has been a full time barber. Look no further for men’s haircuts, or boy's haircuts! McKee's Barber Shop is the premier barber shop in the Lockport, NY area. The search for the perfect place to get the men's or boy's haircuts ends here. Call today to set up an appointment for your next haircut. A haircut is just a haircut, right? Wrong! At McKee's Barber Shop, a haircut is a ritual, a nostalgic throwback to a simpler day when men gathered at the corner barber shop to discuss everything from business to sports. We provide both traditional, short haircuts as well as contemporary and trendy styles. Top quality services and affordable prices make us the most desirable place for men to get their hair cut in Lockport. Mark McKee stays up to date with the latest men's hairstyles. From shaving to haircuts, our barber shop can handle all of your needs. Whether you have a hairstyle in mind or need Mark to recommend something for you, Mark McKee’s Barber Shops is the place to go. Mark is always up for a challenge and he would love to help you out. Residents of Lockport, NY know what barber shop to go to when they want to look their best. Mark's business began in the McKee home. As word began to spread, business began to grow at a steady pace as demand for quality men's and boy's haircuts rose. Now, due to his success, Mark has opened a new facility, McKee's Barber Shop, at the McKee residence, 2918 Quaker Road near Gasport in Barker. Mark McKee is a men's haircuts specialist! Men's haircuts are Mark McKee's specialty. Mark has a new shop he is excited to show off. The perfect combination of brand new premises and a classic barber shop, you will love the Mark McKee experience. The new shop has a comfortable and spacious layout with easy ground level access for anyone looking for men’s haircuts, even the elderly and disabled. 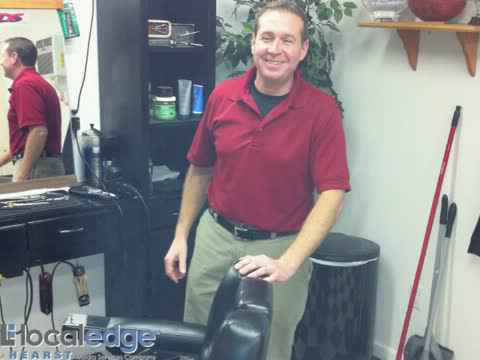 If you're ready to make the change to a new barber shop in the Lockport region, Mark McKee will take care of you. Men's hair cuts might not seem to difficult but if not done correctly, they can be a recipe for disaster. For men and boys of all ages, Mark McKee offers outstanding hair cuts at an affordable price. If you live in Lockport or the surrounding areas and are looking for a great men's haircut, give McKee's Barber Shop a call at 716-807-4083 to make an appointment. Find out what over 1,500 local men and boys already know… this is where you should be getting your hair cut! Mark guarantees you won’t be disappointed. The shop is easy to find, just three miles north of Becker Farms. Appointments are necessary! Call Today! We're a real American barber shop. We provide classic men's haircuts and boy's haircuts that chain salons just can't quite pull off. Come by our community barber shop and see the difference! We have easy ground level access for the elderly and the disabled.